The following Terms and Conditions apply to testing services provided by Face IT DNA Facial Recognition Technology LLC.. See also Site Usage Policies below. “Services” means the provision of laboratory analysis of biological samples or facial recognition photos the Client provides to FACEIT. “Client” means the person(s) or legal entity that purchases Services from FACEIT and/or any test participant who submits biological samples to FACEIT for Services or the legal guardian of a test participant who may be a minor or a legally incompetent adult. 2.2 The Services provided by FACEIT are solely for the use of the Client. FACEIT makes no representation, expressed or implied that the result of the Services is useful for any purpose other than the Service purchased by the Client. 2.3 FACEIT does not guarantee that the samples provided by the participant shall be suitable for Services, or that Services shall provide a conclusive result. Biological samples submitted to FACEIT will not be returned. 2.4 FACEIT reserves the right to use any third party of its choice, if necessary, to perform any portion of the Services purchased by Client. 2.5 FACEIT reserves the right to perform Services using methods and processes that FACEIT deems appropriate. 2.6 For samples collected in New York State, an Authorizing Agent (doctor or lawyer licensed in New York State) must authorize the Services. The Authorizing Agent will also receive test results. 2.7 Calculations from Facial Recognition Reports are derived from human perception and manual visual review not by computer coordinates. 2.8 Results from “Electronic DNA Facial Point Connectivity” are not admissible in a court of law. Court admissible test should have a “chain of custody”. The chain of custody refers to the various chain of “hands” that an actual blood draw or mouth swab sample passes through. The photos submitted for your report will be manually reviewed prior to the release of the report. Your report should not take the place of a physician’s order or the results from a blood test. 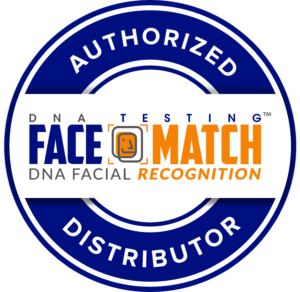 Reports are based on FACE IT DNA TECHNOLOGY DNA FACIAL RECOGNITION LLC. Manual algorithms, a manual visual review process conducted by a technician and not an actual DNA specimen collection. 2.9 Results are available the same day of your submission. *In order to have same day results please submit your questionnaire and photo prior to 4:00 pm Central. Information submitted after that time will be calculated and released the following day (even on weekends) prior to 9:00 pm Central Time. 2.10 For samples collected via Chain-of-Custody (including New York State), FACEIT rigorously follows nationally and internationally recognized standards for court-admissible test results. While FACEIT test results are routinely accepted by courts worldwide, each court (or judge) ultimately determines admissibility. 2.11 Guidance for interpreting the results can be obtained by contacting FACEIT. 3.1 Payment in full or an agreed upon deposit is required before Services can begin. Payments can be made with a valid credit/debit card or prepaid card. Personal checks are not accepted. Personal checks received by FACEIT will be immediately destroyed and Services will be on hold until payment in full has been made. 4.1 Copies of Client results are sent via email and U.S. mail upon request. The Client agrees that FACEIT, its affiliates, its contractors, its distributors, and its suppliers will not be liable for access to order information, results, or any reaction a person may have upon receiving results. 4.2 Order information and results of Services are accessible by the Client. Order information and results of Services are also accessible by a test participant’s legal guardian when the participant is a minor or a legally incompetent adult, even if the legal guardian is not a participant in the test. 4.3 FACEIT may use email and/or text messaging to convey order status as requested. Standard email or text messaging is not securely encrypted, so FACEIT uses the minimum necessary amount of personal information when communicating via email/text message. 4.4 Notwithstanding anything in section 4, all data, forms, customer information, or other information submitted to FACEIT by the Client will be stored by FACEIT in hardcopy and/or electronic form, with case access provided to the Client, to FACEIT, and to government agencies as required by applicable laboratory accreditation guidelines, or as may be required by law. 5.1 The Client warrants that he/she is legally entitled to perform any particular act either directly or indirectly in order to obtain, possess, and provide the biological samples or for photo for Facial Recognition necessary for FACEIT to perform the Services purchased by the Client. 5.2 The Client shall indemnify FACEIT, its affiliates, its contractors, its distributors, and its suppliers against all costs, claims, demands, expenses and liabilities of whatsoever nature that may arise from Services provided to the Client. 6.1 FACEIT does not warrant to Client: (a) that the Services provided by FACEIT shall meet the expectations of the Client; or (b) that Services shall be free from minor defects or errors (such as typos or printing errors) that do not materially affect the Guaranteed Accuracy of test results. 6.2 Further, in no event shall either FACEIT, its affiliates, its contractors, its distributors, and its suppliers be liable for any direct, indirect, incidental, special, punitive, or consequential damages whatsoever that may arise from Services provided to the Client. 6.3 Client agrees that any and all liability of FACEIT, its affiliates, its contractors, its distributors, and its suppliers shall be limited to either re-performing the Services at no cost to the Client, or refunding the amount received by FACEIT for such Services. A person who is not the Client of FACEIT has no right to enforce any of these Terms and Conditions. The construction, validity, and performance of these Terms and Conditions shall be governed in all respects by the State of Indiana, USA Law and be subject to the exclusive jurisdiction of the State of Indiana, USA Courts. A refund may be considered if a written request for refund is submitted to FACEIT before Services have been initiated; no refund shall be considered if Services have been completed. Refunds may be considered at the discretion of Choice DNA Laboratory and may be subject to administrative and handling fees. Partial payments and deposits are non-refundable. No refunds shall be issued if Services have been completed or if your DNA kit or supplies have been shipped. Facial Recognition Services are non-refundable. All DNA testing services have an estimated completion time listed online and can scientifically never be precise. Results are often finished earlier than expected but can exceed estimated expectations. Once testing is initiated no refunds will be issued. 10.1 FACEIT guarantees accuracy when samples are properly collected and submitted to the laboratory for Services. 10.2 Facial Recognition Services are analyzed manually by visual inspection of a human and for that reason do not guarantee accuracy. The results are issued based on the visual findings of the technician. Some things that may influence the accuracy are the following, but not limited to: Accuracy can be affected if alleged fathers are related, if cosmetic surgery has been received by either party, if another technician visually analysis the pictures or if a different picture is uploaded for either the father or the child after initial report is issued. Facial recognition is intended to offer a recommendation of rather DNA Testing would be necessary and not intended to offer viable scientific results for paternity. The amount of DNA that comes from the mother is also important. It may affect the comparison between the alleged father’s and the child’s picture. If you’d like the mother’s picture reviewed please email her photo to support@dnafacematch.com. This must be submitted prior to the technician starting your facial review. It’s absolutely impossible to look at someone’s picture and know without a doubt if they are the father of a child, however with updated technology and updated systems you can get really close and offer a realistic suggestion as to whether or not two people may be related. Facial reports are based on the current ages of the participants and may vary based on the ages of the individuals at the time of the photo. 10.3 The Client must inform FACEIT if: (a) possible fathers are related; (b) any participant has received a blood transfusion or an allogeneic hematopoietic stem cell (HSCT) transplant (such as a bone marrow transplant). FACEIT can only guarantee accuracy if such conditions are brought to its attention prior to providing Services. 10.4 FACEIT shall not be held responsible for improper or fraudulent submission of self-collected samples. 10.5 To contest accuracy, the Client must provide a paternity test report from an AABB accredited laboratory supporting the claim within sixty (60) days from the FACEIT paternity test report date. FACEIT may, at its discretion, re-perform Services at no cost to the Client to confirm results, or provide a refund for Services, as described in Section 6.3. “FACEIT ”, ( “us”, “we”, or “our”) operates the https://DNAFaceMatch.com website (the “Site”). “Client” means the person(s) or legal entity that purchases or uses Services from FACEIT and/or any test participant who submits biological samples, data or personal information to FACEIT or for Services or the legal guardian of a test participant who may be a minor or a legally incompetent adult. While using our Service, we may ask you to provide us with certain personally identifiable information that can be used to contact or identify you. Personally identifiable information may include, but is not limited to, your email address, your name, phone number and postal address (“Personal Information”). We may employ third party companies and individuals to facilitate our Service, to provide the Service on our behalf and to perform Service-related services. These third parties have access to your Personal Information only to perform these tasks on our behalf and are obligated not to disclose or use it for any other purpose.